A couple of years ago I was asked to do a demonstration of creating amigurumi at the Alamo Drafthouse screening of Handmade Nation . I loaded up a ton of free patterns and yarn, some toys I had already made, and set up shop. It was so fun. The first person to sit down for help was a man that was left-handed. Challenging, but we muddled through! Sometime during the day, here came Vickie Howell with her little boy. I didn't even notice, but started to hand her a free pattern and looked up. "Oh, you know how to crochet!" I said, a little starstruck. 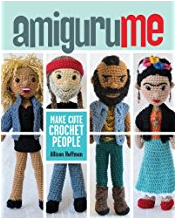 (I'd seen her forever on Knitty Gritty!) So she got a little mushroom pattern and kit for her son and was super sweet. The yarn is soft and shiny, so unlike a lot of the yarn I started out crocheting with. I think sometimes people are drawn mainly to color (and ignore the feel of the yarn) when they're making amigurumi because so many of the wool or wool blend yarns come in mostly muted colors. This is why I think Sheep(ish) works so great for amigurumi. Its a 30/70 wool and acrylic blend that is worsted weight and washable. The worsted weight is what we want as amigurumi-ists because the crocheted fabric shows fewer holes and it holds its shape better. Sheep(ish) has all the bright colors and they all coordinate beautifully. I made a lot of Baby Monsters for Renegade Craft Fair and by far the softest and shiniest ones were the Sheep(ish). Usually a soft yarn has a gauge that I just can't work with. I either have to use a tiny hook to get a really tight gauge or I have even had to use two strands together. With Sheep(ish) I have the softness and gauge I need. I'm sure you'll love Sheep(ish) as much as me! I'm so sure, in fact, that I'm going to give one of you a skein of this awesome yarn along with a kit to make your own Baby Monster! Not only will you get the tools and materials to make your own, but you'll also get a Baby Monster keychain I made out of Sheep(ish) in one of my favorite colors, Red(ish). All you have to do to enter is leave a comment below, telling me your favorite Sheep(ish) color. Check them all out here! Monday morning I'll pick a random number and that lucky person will get everything pictured below! Can't wait for a giveaway? Sheep(ish) is available to order now on Buy.Caron.com and Joann's superstores all over. If you're not sure if Joann's near you carries it, Vickie has provided a Sheep(ish) Finder App on her website. Make sure you follow the rest of the Sheep(ish) blog tour. I've put the whole list below so you can read everyone's take on this. 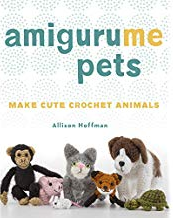 Interesting how knitters and crocheters and amigurumi-makers all find things they like in this yarn, albeit very different qualities. June 9th: Naughtysecretaryclub.com & Ilovetocreate.com (Dual post on the same day. My favorite is the Chartreuse(ish)! Ive been waiting to try this yarn for some time! I love how this line of yarns have such great colors! I cant wait to use it for some amigurumi making! Love the hot pink(ish)! Excited to try a soft but not super thin yarn! My favorite is the Chartreuse(ish). 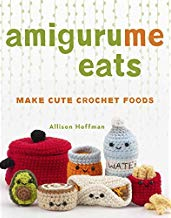 I'm always looking for new yarns for my knitting -- amigurumi makes my want to try my hand at crocheting again!! Very cool. I tend to work in blues and greens, so Teal(ish) is my favorite. It is so hard to choose. I am going to go with Hot Pink(ish). I really like them all though. So many beautiful colors. Today my favorite Sheep(ish) color is Lime(ish). I am a huge fan of red, so Red(ish) attracts me instantly, especially looking at your keychain! But I also love Chartreuse(ish) and Turquoise(ish). Love the brights! I have a thing for Gun Metal to start with and Gun Metal(ish) is perfect! I can so totally picture making something with that color and Teal(ish) together - BEAUTIFUL! Teal(ish) is a great color! There are so many beautiful colors, but I think my favorite today is Turquoise(ish)! I love Teal(ish), it looks so pretty on the website. Hope it lives up to the expectation when I check it out in person! I like all the colors, but generally tend to gravitate towards deep fall shades. So, I'm picking Plum(ish)as my favorite. Thank you. I really love the coral(ish) color. I already know what I would like to make with it! I like Teal(ish) among other colors. I'm currently loving the Robin Egg(ish) color. I definitely love the Plum(ish), but the Olive(ish) is a close second! I like the teal (ish)or lime (ish) Thanks for the great review of the yarn and the giveaway. I saw Sheep(ish) at my JoAnn a few weeks ago, caressed it, loved it. Why didn't I buy any of it? Thanks for the chance to winish! Oooh, Hot pinkish is the best. I heart pink. I love the turquoise(ish) and hotpink(ish). Wow, so hard to choose. I love them all! I love the turquoise(ish) the best. The plum(ish) is a close second. Thank you. I love the coral(ish)! I was just searching for a nice cross of pink and Orange and found them all to be day-too and cheap looking, or muted and dirty looking..this is perfect! Can't wait to combine it with turquoise(ish) and chartreuse(ish)! My fave is Magenta(ish) just love its vibrancy. Like the coral(ish) also, my Joann's doesn't care it - so sad - now have to wait for the processing and shipping of an order. Would love to win one! Can't wait to get my hands on the lushness you and many other have described. Red(ish), though they all look yummy! I think I love lime(ish) the most, but they are all beautiful! I really like the Robin Egg(ish). I'd love to try some! I love Magent(ish). WOuld love to try it !!! Magenta(ish) is just gorgeousish! So is Turquoiseish and chartruesish and greyish... by the way, I love your blog background and header! I'm loving the turquoise(ish), thanks for the giveaway!! I like all the different shades of blue green and purple, i like using yellows too but couldnt find a pic of yellow sheepish. Turquoise(ish) is my favorite! And I like your Little Monster keychain. I LooooooVE Chartreuse(ish)!! I love all the colors but that is my absolute favorite!!! They're all such gorgeous colors, but I think the Magenta(ish) calls out to me more than anything else. What a beautiful set of colors, I love the Magenta(ish) the best! I love the different shades of Black and greys, but would have to go with Magenta(ish) as my favourite! I'm loving the green yarn. I'm a very beginner but the yarn looks very easy to work with perfect for me! Plum(ish)! That yarn looks fantastic. I'd love to try it! Me Me Me!!!!!!! I want to win!!!! I love the teal one! Ooooh it's hard to pick, but I think my favorite today is hot pink (ish) :-). Fun! Really? Really really?? Not only are you giving away an amazing kit that I would LOVE LOVE LOVE to have, I have to pink a favorite Sheep(ish) color? Do you know how absolutely difficult that is? 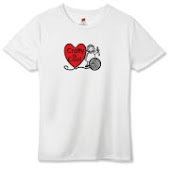 I mean seriously.. and serious yarn lover pretty much loves ALL of them. And I do. I'm a huge fan of yours and Vickie Howell's, and I purely refuse to pick just one. LOL ;) <3 I can envision a use for every single color, but if the only way to qualify is to pick ooonnneeee, well then I guess I'd go with Plum(ish). I love the pink(ish) and the teal(ish). Thank you so much! Robin Egg(ish) is my fav! There are lots of good ones, but I think I like Teal(ish) best. loving the Coral(ish)! looking forward to crafting some amigurumi with these beautiful colors! great to hear your positive reviews before I buy. Although ALL of the Sheeph(ish) colors are vibrant and beautiful, I'm drawn to the cheeriness of Coral(ish). I love the Teal(ish) but all the colors are great!! I love the Chartreuse(ish) and the Magenta(ish). Sounds like a great yarn!